Numbers are essential in every aspect of our lives. Our age, our weight, our height, our blood pressure, and our income are all numbers that dominate our lives. Numbers are a universal language that can be used to help us understand or explain some of the more complex factors of life. This is why when we look at comparing two trucks, sometimes it’s best to just let the numbers speak for themselves. The very first number you need to recognize about 2018 Chevy Silverado vs. 2018 Ram 1500 is the year. These both being 2018 models indicates years of innovation and passion that could never have been completed overnight. The 2018 Silverado 1500 has origins dating all the back to 1975 when it was just a trim level for Chevy’s many other models. It was put through the wringer and started at the bottom like many of us have, but in 1998 it finally blossomed into its own namesake and has already been through three generations of blood and sweat. Now in 2018, there have been a few changes in the last year such as a backup camera and tire pressure monitor. Chevy’s well-designed packages are also more widely available. The 2018 Ram 1500 dates back to 1981 when Dodge Ram first began producing their first pickup trucks for the general consumer. 2018 brings very few new changes, mostly just a shifting of what features are standard or optional, but there is the introduction of the Harvest and Tungsten edition which upgrades you to all the top-of-the-line features. Overall, 2018 truly is a beautiful year to witness the innovation of two passionate pickups. 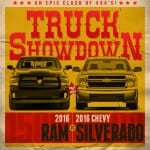 Now you probably noticed both the 2018 Chevy Silverado 1500 and the 2018 Ram 1500 contain the number 1500 at the end of their model title. This actually has a long history attached to it, but for simplicity’s sake, it basically is just a reference to size and carrying capacity of a pickup truck. It’s a common way to classify the differences between light and heavy-duty trucks from the same manufacturer. Generally speaking, you can say that a truck labeled 150 or 1500 is considered a half ton truck, those with 250 or 2500 are three-quarter ton trucks, and those with 350 or 3500 are one-ton trucks. Basically, this puts the 2018 Silverado 1500 and 2018 Ram 1500 in the light-duty pickup classification. Price is clearly a number that will matter to a majority of buyers, so it goes without saying that this number will be one of the first people look at. The 2018 Chevy Silverado starts at $28,300 while the 2018 Ram 1500 starts at $27,295. This is just barely a $1,000 difference, and considering the variance in towing capacity that seems like a fair deal. There are a few numbers in the engine that play an essential role in defining a pickup truck, but the first is the size. Generally speaking the size of the engine determines the potential it has to offer, and the size of an engine is identified by the liter or L number. You will also most likely see either a 4-cylinder, V6, or V8 in the engine that is also used to indicate size. The 2018 Silverado 1500 offers a 4.6-liter V6 engine, a 5.3-liter V8 engine, and a 6.2-liter V8 engine. The 2018 Ram 1500 offers a 3.0L V6 diesel engine, a 3.6L V6 engine, and a 5.7L V8 engine. Horsepower is all about acceleration and speed. When it comes to horsepower, the numbers lean heavily towards the 2018 Chevy Silverado. The max horsepower of the 2018 Silverado is 420 hp, while the max of the 2018 Ram is 395 hp. Generally shown next to horsepower is the torque. Just as horsepower indicates acceleration, the torque of a pickup truck indicates towing capacity. Again in this category, the numbers are in favor of 2018 Chevy Silverado. The 2018 Silverado has a max of 460 lb-ft of torque without even having a diesel option yet. The 2018 Ram offers a still fair 420 lb-ft of torque if you invest in the EcoDiesel V6 engine. Also, something to note is that the standard engine for the 2018 Silverado has a best in class 305 lb-ft of torque for a V6 engine. Trucks aren’t known for being the most eco-friendly vehicles, but both of these trucks do a fair job at trying to save on gas money while lowering the mileage. This is one number the 2018 Ram is superior to the 2018 Silverado by just a hair. The 2018 Ram has a max of 27 mpg highway while the 2018 Silverado offers 24 mpg highway. There are many different types of weight numbers a truck can be measured by, but the one that best exemplified the pickup as a whole is the curb weight. The curb weight is the weight of everything except passengers and cargo. You will need this number to properly determine how much you can actually tow. The curb weight of the 2018 Chevy Silverado is 4,515 to 5,461 pounds, while the 2018 Ram 1500 is 4,520 to 5,673 pounds. The fact that the 2018 Silverado is lighter can in some ways be an overall advantage to its performance abilities considering this leaves more room for passengers and cargo. The dimensions of a truck will give you the best idea of its size. The 2018 Silverado is 206-240″ L x 80″ W x 74″ H, and the 2018 Ram 1500 is 209-238″ L x 79-82″ W x 74-78″ H. This makes the Silverado smaller despite its superior muscles. Saving the best and more important number to a pickup truck for last, the towing capacity is the entire weight your truck can move with. The 2018 Silverado is at the top of its game with an outstanding towing capacity of 12,500 pounds when properly equipped, while the 2018 Ram 1500 falls just a little behind with a towing capacity of 10,150 pounds. Numbers can say a lot, and in this case, they are clearly stating that the 2018 Chevy Silverado is the stronger choice out of these two beasts of the road. But, that’s just us. After adding up all of your must-haves, which one, the 2018 Chevy Silverado vs. 2018 Ram 1500 adds up in your favor?